And now we know – the much-debated, fully hyped questions surrounding the remaining haunted houses for the 2015 edition of Halloween Horror Nights can finally be answered. Universal Orlando has announced the official lineup for Halloween Horror Nights 2015, featuring plenty of fan favorites and ghoulish new adventures courtesy of Universal’s wickedly clever designers and special effects artists. It’s the 25th anniversary of Halloween Horror Nights, so one can imagine the added excitement surrounding this year’s event. Bringing back the fan-favorite ‘An American Werewolf in London’ to the party should delight fans who are making plans to attend. Horror Nights 2015 will feature 9 haunted houses, 5 scare zones, and 2 shows on select nights from Sept. 18 to Nov. 1. Check out TicketsatWork.com for some scary-good ticket specials for this year’s Halloween Horror Nights. An American Werewolf in London – Step into John Landis’ landmark 1981 horror classic. From the attack on the English moors to the bone-crunching transformation, it’s one of the most popular houses in Halloween Horror Nights history. A birthday party to celebrate the iconic Michael Jackson sounds like just about the best birthday party ever! This is a birthday party where there’s definitely no need to worry about the music being any good! It’s going to be quite a day and night on August 29th at the Mandalay Bay Resort & Casino in Las Vegas, home of Michael Jackson ONE, Cirque du Soleil’s thrilling tribute show to the work, innovative spirit, and legacy of Michael Jackson – the King of Pop. Michael Jackson ONE, and the Estate of Michael Jackson, are inviting guests to celebrate the legendary King of Pop as they host the annual Michael Jackson birthday party, which features a one-time only performance, special Q&A with some cast members from the show, a book signing with Jackson’s longtime costume designer, and much more. You might already be in Las Vegas, or have plans to be in Vegas this weekend, but for sure you should ring up TicketsatWork.com for special discount passes to this amazing party to celebrate the iconic Michael Jackson. From coast-to-coast there is Six Flags entertainment for anyone who enjoys a good time with friends and family. With 18 properties throughout North America consisting of theme parks, thrill parks, and water parks, you can always find a great vacation destination at a Six Flags amusement park. If you find yourself at Six Flags Great Adventure in Jackson, New Jersey (situated between New York City and Philadelphia) then for sure check out their new roller coaster — it’s called the El Diablo, and it stands 7 stories high. Or maybe you’ll be jetting into Los Angeles, CA and visiting Six Flags Hurricane Harbor. The old adage is that ‘a picture is worth a thousand words.’ With our new Jersey Boys sweepstakes we need slightly fewer words. In fact, just a really good caption that perfectly sums up this heated scene from the award-winning Broadway musical that is presently wowing audiences in Las Vegas. Swing by our Twitter page (@TicketsatWork) and tweet us a photo caption for a chance to win two tickets to see Jersey Boys in Las Vegas. Think you have the ideal description for this scene from the musical? Unleash your captioning creativity at @TicketsatWork and you could be seeing Jersey Boys in Las Vegas. Be funny! Be dramatic! Maybe you’ve seen the show (and ready to go again!) and know exactly what needs to be said here, or maybe you just really, really want to see Jersey Boys for the first time on the Vegas Strip and have the most awesome caption for the photo. The best, most clever caption is going to win someone two tickets to the show! The contest will run until this Friday, Aug. 21. We will announce the winner that same day at 4 p.m. EST. Already a big hit on Broadway, winning four 2006 Tony Awards including Best Musical, the popular musical combines comedy, drama, dancing and live music with a superb cast that will delight you with some of the most amazing voices on the Las Vegas Strip. 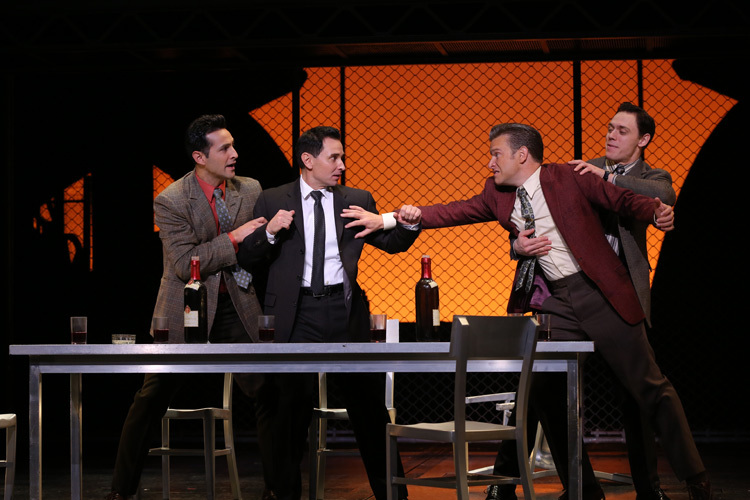 And now two tickets to Jersey Boys Las Vegas can be yours. Follow @TicketsatWork to win!